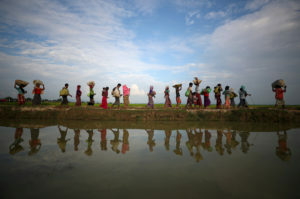 GENEVA — Investigators working for the U.N.’s top human rights body said Monday that Myanmar military leaders should be prosecuted for genocide against Rohingya Muslims, taking the unusual step of identifying six by name among those behind deadly, systematic crimes against the ethnic minority. The United Nations does not apply the word “genocide” lightly. The council created the mission in March last year — nearly six months before a string of deadly rebel attacks on security and police posts set off a crackdown that drove Rohingya to flee into neighboring Bangladesh. The U.N. estimates that more than 700,000 have fled. AP writer Julhas Alam contributed from Cox’s Bazar, Bangladesh.